FILE - A May 22, 2017, photo shows cooling towers at the Three Mile Island nuclear power plant in Middletown, Pa.
Forty years after the partial meltdown at the Three Mile Island nuclear plant, John Garver can still recall the smell and the metallic taste in his mouth. "It's time to shut it down," said Garver, who was a 40-year-old salesman when the accident occurred on March 28, 1979, and is now retired and near 80. "I was against it from the beginning," said Garver, who works part time at the Middletown boat club on the banks of the Susquehanna River. "I'm against it now and I was hoping in my lifetime that it will close down," he added, gazing from beneath a worn red fisherman's cap at the giant cooling towers spitting out vapor into a cloudless sky. "Maybe I'll get my wish." He just might. The owner of Three Mile Island, Exelon Generation, has announced plans to shut down the money-losing facility on Sept. 30. Pennsylvania lawmakers are working on a rescue plan, however, to try to save the plant and the hundreds of jobs it provides. About 40 percent of the electricity in the eastern U.S. state is generated by nuclear power facilities. Forty years after the partial meltdown at the Three Mile Island nuclear plant, John Garver can still recall the smell and a metallic taste in his mouth from the event. "It's time to shut it down," said the former salesman, who was 40 when the accident occurred on March 28, 1979. The 1979 meltdown at Three Mile Island remains the worst nuclear accident in U.S. history although it pales in comparison to the disasters at Chernobyl and Fukushima in 1989 and 2011, respectively. 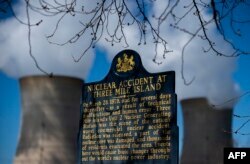 No one died or even seriously injured at Three Mile Island, but the accident sparked nationwide concern about the safety of nuclear power and put the brakes on construction of new reactors. Garver was among the more than 140,000 people who evacuated the surrounding area following the partial core meltdown at Three Mile Island. "We went away for two days," he said. "After they said everything is OK now, we came back. "We were told to go inside, pull the blinds and close the door," he said. "The radiation won't bother you that way, they said." Frank Waple, 58, the chief operator of the control room at Three Mile Island, doesn't agree with those who want to shut the facility down. "It would definitely have a large effect on the economy of the area," Waple said, warning that Middletown would risk becoming a "ghost town." "The township gets a tremendous amount of taxes from the plant," he said of Middletown, where many front lawns display signs reading "Nuclear Powers Pennsylvania." 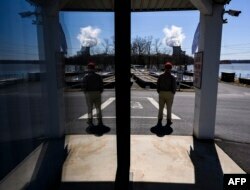 John Garver looks at the operational nuclear plant on Three Mile Island, run by Exelon Generation, from a boat house in Middletown, Pa., March 26, 2019. "The plant also gives money to senior centers, youth groups, libraries, bookmobiles, fire departments," Waple said. "They are constantly engaged out in the public and supporting it." Waple, who has spent his whole career at Three Mile Island, said it might also be difficult to find another job. "When you get to be close to 60 in this game, it's hard to go to another plant," he said. Waple is close to retirement, but that is not an option for Nathan Grove, 37, an electrician at Three Mile Island. "I'm a single dad," Grove said. To "just stop and transplant would be difficult. "I'm not going to go away from my daughter. She's everything to me," he said. Fighting back his emotions, Grove said he would "push the fight to keep us open" and "make sure people understand the benefits that nuclear brings to the environment." "Nuclear is one of the best ways to help keep the air clean," he said. "People are starting to hear it, but it's difficult. "I think there's a stigma attached," he said. Speaking to AFP in nearby Harrisburg, the state capital, Eric Epstein, chairman of the watchdog group TMI Alert, brushes aside the arguments for keeping Three Mile Island open. 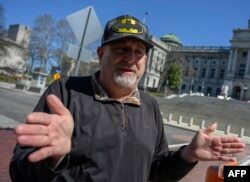 Activist Eric Epstein, speaking during an interview with AFP in Harrisburg, Pa., March 26, 2019, brushes aside the arguments for keeping Three Mile Island open: "It's an aging plant. It's time to shut it down." "It's an aging plant," said Epstein, who was speaking near the state legislature building where Three Mile Island's fate will be decided. "It's time to shut it down. It can't compete," he said. "We don't have to keep bailing out a failing industry. It makes no sense." Epstein said Exelon, Three Mile Island's owner, would be able to relocate many of the current employees or put them to work cleaning up the plant. "That is a charade, to say the jobs will be lost," he said. "The world changes," he added. "Life goes on." Back at the Middletown boat club, Garver agreed it is time to turn the page on Three Mile Island, which he said may have been responsible for the cancer death of his aunt. "Who knows?" he said, puffing on a cigarette. While Garver tries to put it behind him, the terrifying events of four decades ago seem to pursue him. Earlier this week, Garver arrived home to find the movie The China Syndrome playing on television. The movie starring Jane Fonda and Michael Douglas, in a story about safety dangers at a nuclear power plant, hit theaters around the country just weeks before the Three Mile Island accident.